It’s rare enough to find original Seamaster 300s. Yet, often, the original examples are worn to hell with flaking lume, abused cases, and corrosion peppering the movement. 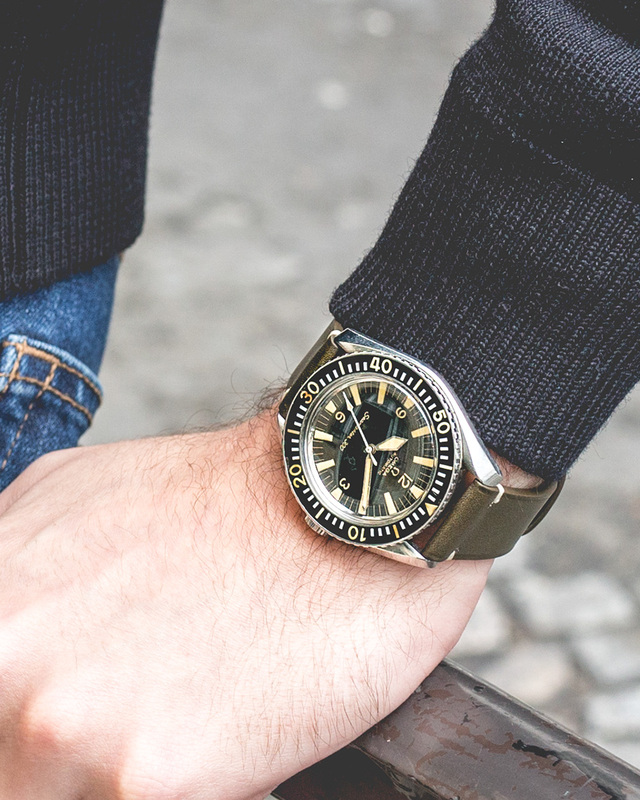 Today, we have the opposite: an original, yet very composed Seamaster 300. The 300 was introduced at the end of WWII to British Navy divers for pure field use. Today, those original military references are as rare as they are expensive. Civilian references followed closely thereafter. This reference 165.024 is the elegant no-date, sword-handed, lyre (no bevel) lugged variation. I don’t mean to be negative straight from the off, but here’s the problem with most 300s: they aren’t, strictly speaking, Omegas. Rather generously (and unlike Rolex), Omega of the 1960s made many spare components and widely distributed them to ensure their watches stayed functional. Not to miss out on potential profits, many industrious fans have since assembled watches entirely out of these new-old spare components. With little to designate original assemblies, it can sometimes be difficult to tell original little-worn Omegas from older watchcos. Not so today. This is what we all rarely see but often lust after. The Seamaster 300 here example sports an even and honest patina. The bezel hasn’t cracked and still wears a legible yellow, matched to its tritium dial perfectly. The hands are still entirely lumed. The dial is clearly legible and evenly faded. The unpolished case has all the hallmarks of daily wear without abuse. The inner case back markings are correct. The cal 550 movement shows its age with some markings and corrosion, yet remains overall in very strong condition. Boxes and papers are the only thing missing. That and a navy NATO (to each their own). As a result, it presents some serious value. I find this one of the most elegant utilitarian Omegas of all time. Find it here from Joseph Bonnie for 6490 EUR.